Be thankful for the goats! 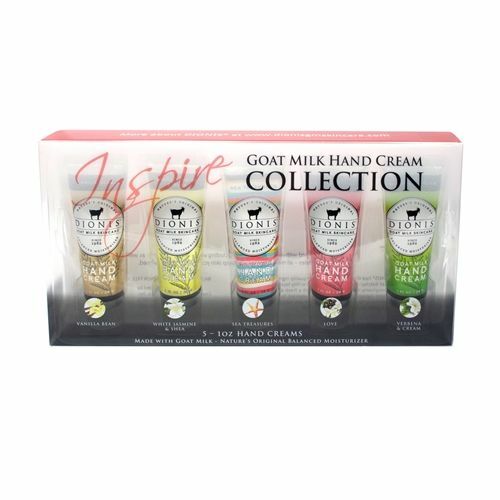 Goat milk is the key ingredients in the wonderful products from our friends at Dionis, and their Hand Cream Set will give you a fabulous sampling of 5 scents. Why goat milk? Because goat milk is rich in vitamins A, B complex, C, D, and E, it’s a potent moisturizer and helps your skin be more elastic. Plus, the pH is closed to that of your skin, so it’s absorbed very well without any greasiness. The 1 oz size tubes in this collection are the perfect size to just pop into your backpack or purse to make sure you’ll always have soft, smooth, healthy, blissfully-smelling skin. We’re convinced that goat milk is the way to go!